Comprehensive research report on global hair care appliances market by Persistence Market Research covers in-depth market assessment and vital insights on various market segments that can assist the reader in slating key strategies and devise future moves to gain competitive advantage. The research study covers forecast analysis of the global hair care appliances market along with scrutiny on changing market scenario across key regions in the globe. Global hair care appliances market concentrates on several opportunities, drivers, key trends, challenges, macroeconomic aspects and socioeconomic factors that influence the growth of the global market. The analysis of these facets of the market is carried out across various regions as the magnitudes and intensities of these aspects differ from region to region. This portrays a global perspective in front of the reader who can gain insights pertaining to the growth potential of a particular region during the nine year time period. In addition, the research report portrays an unbiased assessment of the global hair care appliances market. Accuracy of the research and data lies in the process used to carry out the research. Weighted assessment of global hair care appliances market is underlined by an extensive research methodology that entails secondary research that initiates the market research and primary research for deep diving in the market. The data gathered from secondary research is analyzed collaborated and revaluated via primary research. The data gathered from each interview conducted in primary research program is verified in the consecutive interview thus increasing the accuracy of the data point. Likewise, data points pertaining to every market segment and across every region along with global data undergo multiple funnels of valuation thus arriving at near 100% accuracy. The data gathered from key sources, secondary research and primary research are triangulated thus achieving an accurate global market representation. The research report on global hair care appliances market is a complete information package. It covers analysis on key players involved in the manufacturing of hair care appliances. Their market shares, SWOT analysis, developments, innovations, financials and strategies are analyzed and presented in a systematic format in the research report. This competition dashboard can support upcoming businesses as well as established in planning and formulating strategies in the market against the hanging market dynamics. Comprehensive research report on global hair care appliances market delivers value by providing actionable intelligence and valuable insights. The integral research team of every organization can be benefitted with the heavy lifting Persistence Market Research performs with respect to gaining high level market insights by scrutinizing the entire market. This sort of intelligence can be directly used by your research team to gain a third person unbiased high level accuracy market data that can be used to achieve your respective research milestones. Detailed market research with weighted market segmentation, higher accuracy of market statistics, in-depth competitive analysis and analysis of key influencing aspects are few of the characteristics enhancing the quality of this research report. Moreover, this research report can be used to plan every step from conceptualization to commercialization and new market entry. Systematic report structure and convenience in reading adds to the credibility of the research report. 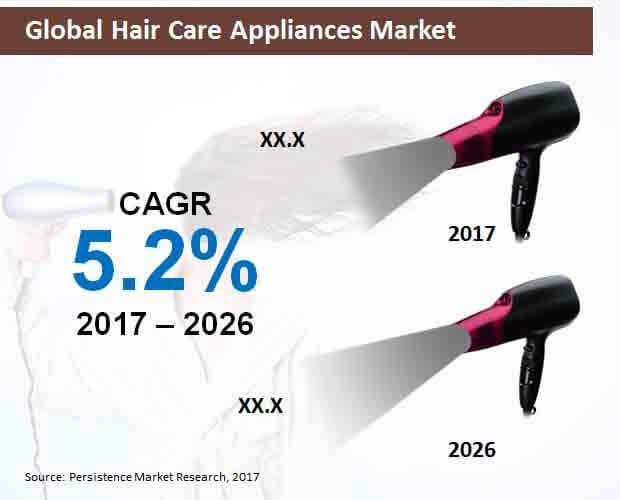 The research report on global hair care appliances market can be useful to strategists, market research professionals as well as marketing personnel involved in hair care appliances. It brings the much needed value addition and a 3600 holistic view of the entire market. Personal care sector has gained high attention among consumers. Consumers are becoming highly conscious regarding grooming and personal hygiene. This has led to growing usage of personal care appliances especially across developed regions. Hair care appliances, being a part of personal care, are gaining sufficient traction among different consumer classes. Both men and women are using hair care appliances to improve their grooming and hygiene. Global hair care appliances market is witnessing a steady pace. Technological advances in hair care have raised the expectation bar of individuals who are demanding for better quality hair care appliances. Along with developing markets, emerging economies also have reflected higher adoption of hair care appliances. Sale of hair care appliances in these regions has boosted the growth of the global market and this trend is expected to continue in the coming years. Men end users for hair care appliances are increasing and are expected to present potential opportunities for players to introduce advanced appliances for men in the coming years. Persistence Market Research has covered an in-depth analysis on global market for hair care appliances. As per the analytical research study on hair care appliances, the global market is projected to expand at a value CAGR of 5.2% during the period of analysis, 2017-2026. Need of time saving hair care appliances among men and women is expected to generate high growth opportunities for the global market in the near future. Players have heavily invested in research and development to alter their products as per consumer preference and requirements. Moreover, large companies have collaborated with local players, either by forming strategic alliances or acquisitions, to gain hold of the local market. Players that are operating in the global hair care appliances market include Philips, Panasonic, Conair Corporation, Helen of Troy, TESCOM, Andis and Beauty Elite Group. Asia Pacific excluding Japan (APEJ) region is expected to continue fuelling the growth of the global hair care appliances market. Increasing population in India and China has largely contributed to the use of hair care appliances. Moreover, manufactures have introduced various up-gradations in their products that have spurred the adoption of hair care appliances across APEJ. Sales of hair care appliances in this region is poised to cross US$ 6 Bn by end of assessment period largely driven by middle class population in China and India. South Korea has also shown higher contribution for growth in sales of hair care appliances in APEJ during the forecast period. Flat irons are widely used hair care appliances. Their adoption is driven by increasing demand from customers for hair straightening giving salon type quality at home. Several developments in flat irons has pushed their acceptance worldwide. Recent innovations include Panasonic’s newly launched flat iron device that works on nanoeTM technology, is used for hair straightening. According to this research report, flat irons continue to dominate the global hair care appliances market by largely contributing to the market’s growth. Sales of hair care appliances depend upon various aspects such as brand name, specifications and appropriate distribution channels. By far, manufacturers have focused on specialty stores that are promising higher sales of their products. These stores are expected to retain their status quo as lucrative sales channel for hair care appliances in the coming years. Also, rate of sales of hair care appliances from departmental stores is also expected to grow at a significant pace during the forecast period. Use of hair care appliances has been higher among females. However, with rising trend of self-grooming and personal hygiene, the use of these devices has been increasing among men population as well. Appliances such as hair dryers have gained high traction among males. The use of hair care appliances among males is expected to rise at a rate of 6.8% during the forecast period. Women, on the other hand are still a dominating segment in the global hair care appliances market.